Throw a great dinosaur birthday party at home! Dinosaur birthday parties have been popular since the Triassic Period, which was a few million years even before the famous Jurassic Period–that’s a long run of popularity! Today’s dinosaur birthday bash proves why dinosaurs are such an enduring, endearing theme. My favorite parts of this birthday include the “Roar Means Happy Birthday in Dinosaur” party supplies, especially the party hats and cupcake toppers, that giant inflatable dinosaur as well as the DIY dinoculars – binoculars crafted for hunting dinosaurs from paper rolls and ribbon. Enjoy an outdoor dinosaur birthday party! This outdoor birthday setting looks peaceful, but watch out for that red dinosaur! An inflatable, almost-life-sized, dino grabs your attention and marks the dinosaur territory theme right away. Dinosaur skin party hats (think scaly!) that come in colors that dinosaurs never did, ramp up the festivities as they declare “Rawr Means Happy Birthday in Dinosaur”. Fancied up craft paper spools become Dinoculars for adventuresome guests. A water table play station provides cool fun between trips to the refreshment tent where guests will discover cookie-cutter PBJ dino sandwiches and veggie trays and dips for “Herbivores: those who eat plants”. After roaming the wilds, guests can scope out the cake and cupcake station, which is cleverly marked for “Dessertivores: those who eat sweets”. Brown paper poms and a wooden cake stand further the dinosaur age party theme. Dinosaur decorated cupcakes alternate with miniature party banners declaring the birthday boy is “3” and both are colored-coordinated with the leaf-green cake topped with another friendly-looking dinosaur. You want a delightful outdoor party, with lots of fresh air, room to roam and tons of charm? You’ve got it with this darling boy’s dinosaur birthday party that delights a range of ages! Check out these great dinosaur party supplies gathered by the crew at Spaceships and Lasers. 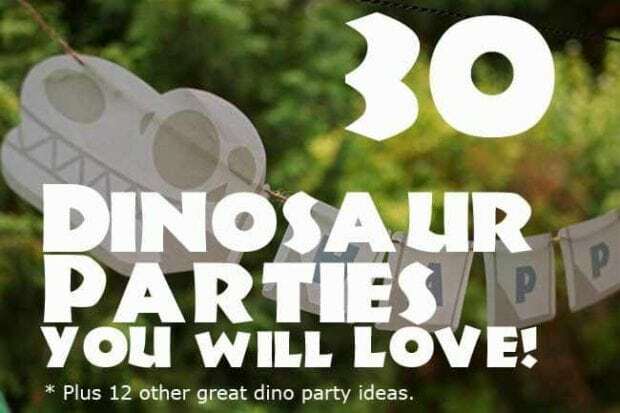 Check out even more great dinosaur birthday party ideas.